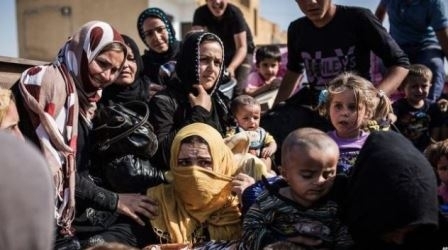 TURKEY (ANS – July 10, 2015) — More than four million Syrians – a sixth of the population – have fled abroad to escape the conflict in their country, the United Nations has said. Many of them are Eastern Rite Christians fleeing the persecution of groups like Islamic State, also known as ISIS. According to the BBC, a surge in the number of people crossing into Turkey has increased the total by one million in just 10 months. The refugee crisis is the largest resulting from a single conflict in nearly a quarter of a century, said the BBC. The UN High Commissioner for Refugees (UNHCR) said Turkey is home to the largest number of Syrians refugees – 1.8 million – many of whom are Christians, and is reportedly preparing for a new influx as the conflict escalates near the border between the countries. Mr. Guterres told the BBC that Europe would need to help more as the crisis worsened. The UNHCR said that if Syrians continued to flee at the same pace it expected the number of refugees in neighboring countries to reach 4.27 million by the end of 2015. More than 230,000 Syrians have lost their lives in four years of armed conflict, which began with anti-government protests before escalating into a full-scale civil war. More than 11 million others have been forced from their homes as forces loyal to President Bashar al-Assad and those opposed to his rule battle each other – as well as jihadist militants from Islamic State. 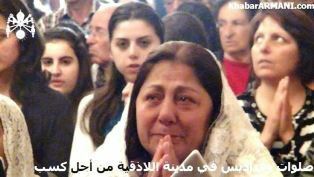 Photo captions: 1) Grieving Syrian man. 2) Assyrian refugee Christians 3) Man carrying badly injured girl in Syria. 4) Dan Wooding pictured outside the Kurdistan Parliament in Erbil, in nearby Northern Iraq. About the writer: Dan Wooding, 74, is an award-winning author, broadcaster and journalist who was born in Nigeria of British missionary parents, and is now living in Southern California with his wife Norma, to whom he has been married for nearly 52 years. They have two sons, Andrew and Peter, and six grandchildren who all live in the UK. He is the author of some 45 books, and has travelled widely in the Middle East reporting on persecution there for ANS. * You may republish this or any of our ANS stories with attribution to the ASSIST News Service (www.assistnews.net).